Guilt is present in the very hesitation, even though the deed be not committed. Bubbles Dietbar’s healthy outlook made me feel like a downright felon tonight. It probably also makes many others feel the pang of guilt as they walk past this tiny cafe of diet goodness. It’s bad enough that I have to pass it as I walk over to Falafel Alley. Bubbles even sits next door to an American style Diner! How could someone possibly eat a stack of pancakes with eggs, bacon, toast, hash browns, and coffee while next door is this quaint cafe filled with healthy food? 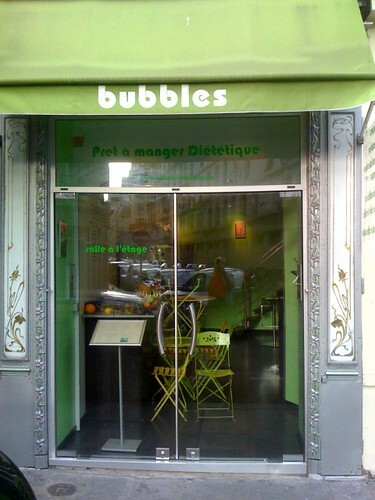 Fortunately, Bubbles Dietbar was closed tonight. I was able to walk straight by to King Falafel to grab an overflowing falafel pita. This is actually the first time I’ve seen the cafe. Its bright green awning would normally catch my eye. 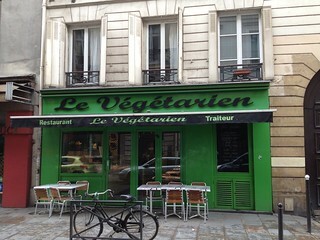 So, perhaps this is a new restaurant for Paris. Their online menu shows a plethora of vegetarian soups, salads, sandwiches, and desserts. They are conveniently located near the St. Paul metro. I’ll have to find a new route to falafel alley or I may find myself pressured into eating something healthy when I’ve got my heart set on something else. There’s nothing particularly vegetarian about this patisserie. In fact, the place is known for its bizarre macaroon combinations that have included foie gras as a filling. However, Pierre Hermé is an amazing place to indulge in, regardless of your vegetarian/vegan/macrobiotic/organic leanings. Legend has it: Hermé worked for Gaston Lenôtre, the world famous pastry chef. They are known as the masters of macaroons and this historic patisserie has been serving the aristocracy for decades. 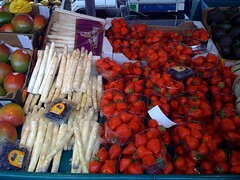 However, Hermé felt the urge to move on and opened his first place just down the street on Rue Bonaparte. Where Lenôtre is about classic French taste (etoile patterns, delicate macaroons, pastels…), Pierre Hermé is bold, experimental, funky, surprising, and above all delicious. It’s enough to get the true French Queen, Catherine Deneuve, to wait in line for morning pastries. At least that is the story I’ve heard and desperately want to believe. I love the idea of standing in line for an almond croissant with such a legend, chatting about the latest macaroon, working with Luis Bunuel , and the muggy weather. I was surprised by the reasonable prices. The almond croissant was the same price as the flat, spongy thing seen in more common patisseries around the city. The macaroons were beyond description. I tested the passion fruit and chocolate creation. I also bought his signature chocolate balls. Unfortunately, I didn’t eat them fast enough and they grew mold. That’s what you get when you expect your food to be filled with preservatives and someone hands you a touch of purity. Oh well, I’ll just have to make another trip. There’s a bunch of photos on Flickr from people that enjoy the goodies at Pierre Herme. They’ll give you an idea of the passion these morsels create. If you are looking for a delicious dessert, a quick pick me up, or a great gift to bring back home: visit Pierre Hermé.